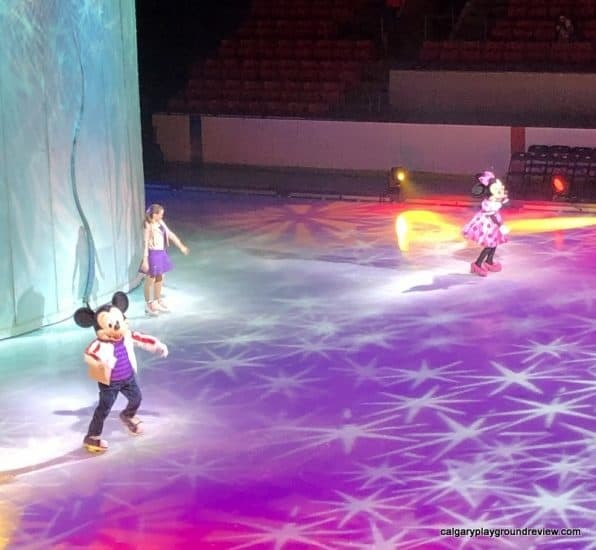 This year (2018), the Disney on Ice show is called Dare to Dream. It features a short set from Coco as well as Beauty and the Beast, Cinderella, Rapunzel, and after a short intermission Frozen and Moana. The show features abbreviated versions of each of these stories, which get longer as the show progresses. Coco only gets two songs, but the show includes most of the big numbers from Moana and Frozen. 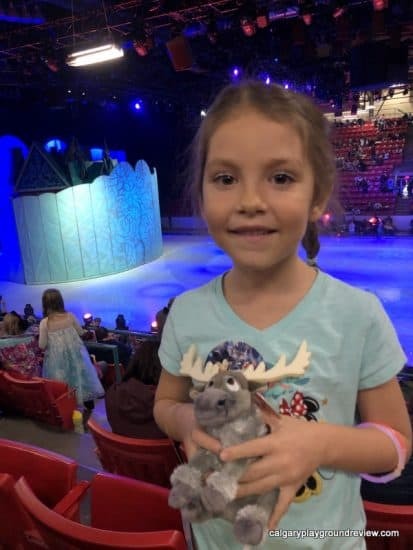 This was my family’s first time to Disney on Ice. 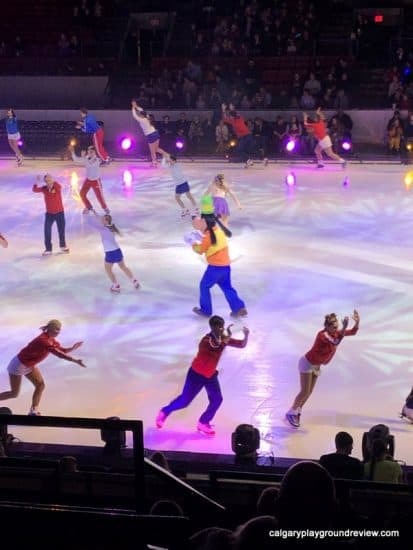 I have to admit, I thought it might seem a little odd to have the characters skating around. 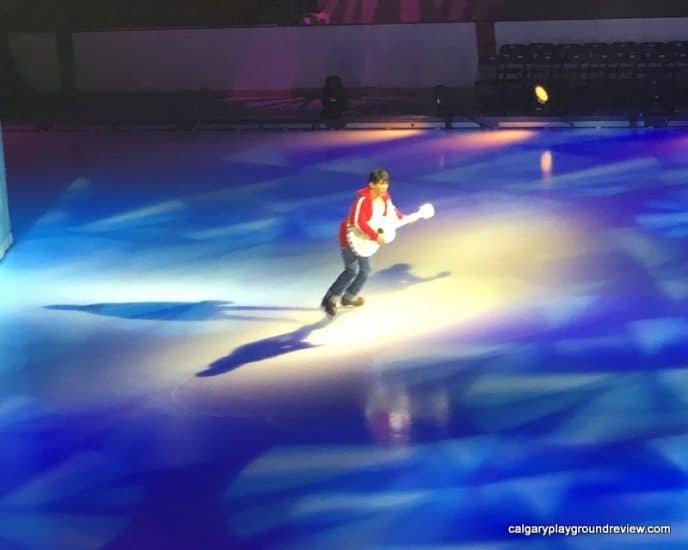 But from the first step onto the ice, it seemed just as natural as characters randomly breaking out into song in the middle of a movie. 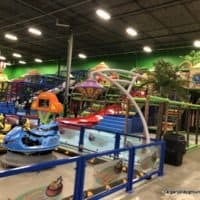 I was pretty confident my 6 year old would love it but my 3 year old and my husband and I all had a great time too. You get to see shortened versions of multiple Disney movies that hit all the highlights. 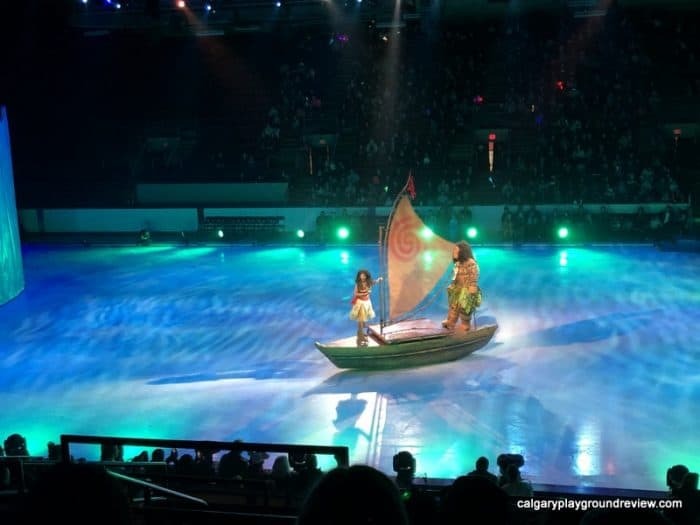 The music is captivating, the sets are well done and the skaters and numbers are excellent. They manage to make each section feel fresh and not feel repetitive. Dare to Dream runs for two hours, including a brief intermission. 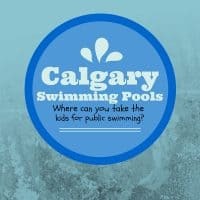 My kids are 6 and 3, and they had no problem sitting for that long. 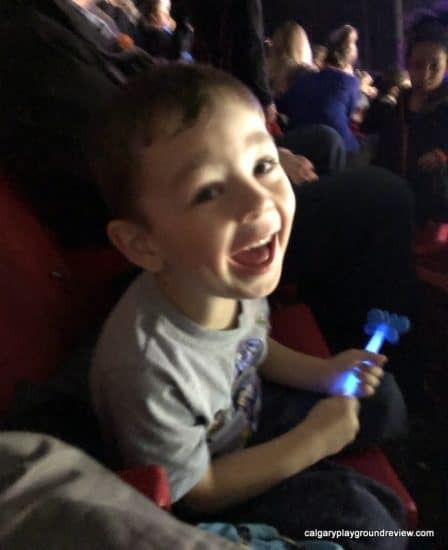 I was a little worried about my 3 year old, particularly because we went to the late show (7-9pm) which starts after he is usually in bed, but it ended up being totally fine. The show sets a good pace from beginning to end. 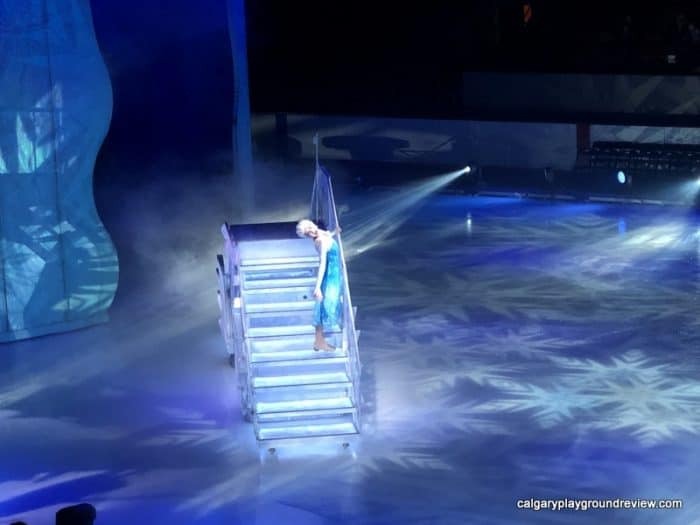 My three year old’s favourite part was probably near the beginning where Mickey, Minnie, Goofy and Donald are out on the ice. Goofy ‘falls’ a few times and my son thought it was hilarious. 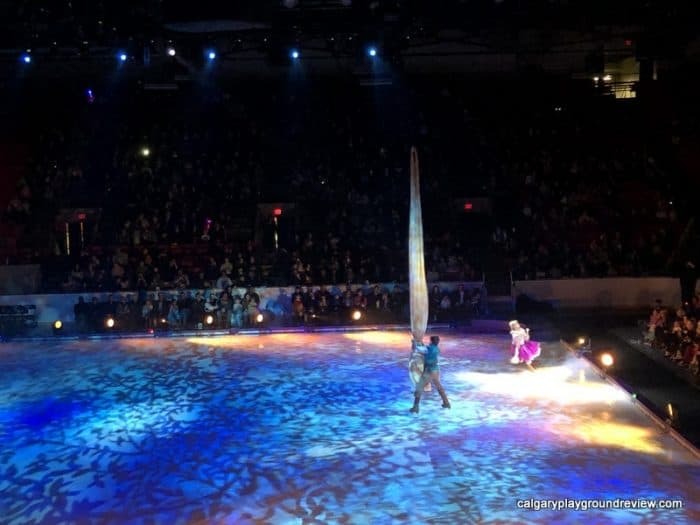 One of the coolest parts of the show was a series of aerial tricks by Rapunzel and Flynn, who wrapped their arms with “hair” hanging from the ceiling and were lifted into the air repeatedly. Before finding your seats, you will need to herd your kids past a lot of snacks and souvenirs. 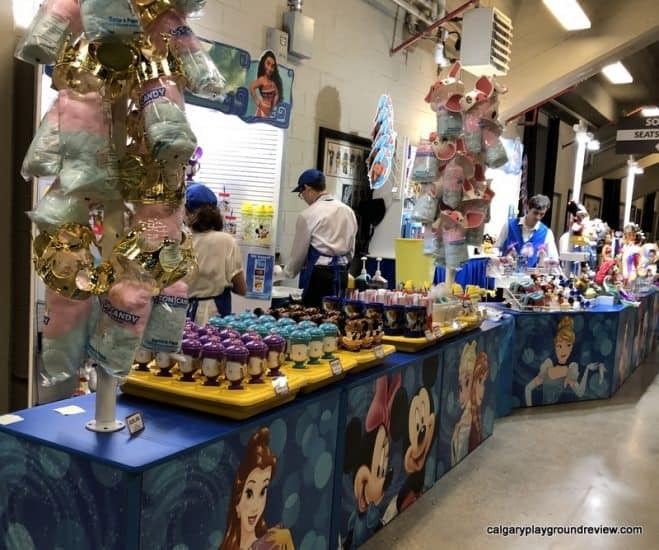 You can find stuffies, cups that come with snow cones, light up wands (including a Maui hook), cotton candy that comes with a Pua hat or a golden crown and more. You can easily spend more on souvenirs than you did on your tickets if you left it up to your kids. You can get the usual treats and burgers from the Corral’s concession as well. 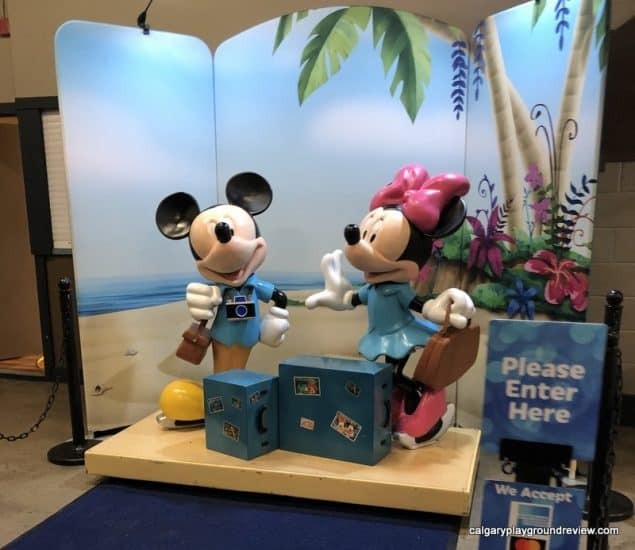 You can also purchase a couple couple different souvenir photos – like this one where Mickey and Minnie are the backdrop. To help make your experience a little more affordable, I highly recommend bringing some of the fun with you. Of course wearing princess dresses is very common but you may also want to consider bringing a Disney stuffy or grabbing princess crowns or light-up/glow toys from the dollar store. Tickets for Dare to Dream are on sale now: online at www.ticketmaster.ca. Prices range from $30 to $88, and tickets are subject to the usual handling, facility, and convenience charges. There aren’t really any bad seats at the Corral during Disney on Ice. We were on the side at about row 13 and the view was great. The action is carefully choreographed so that it’s directed toward the sides as well as the centre. I thought the show was fantastic. 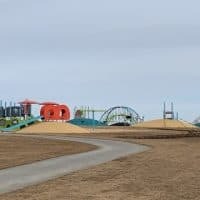 It surpassed my expectations and was excellent from beginning to end. 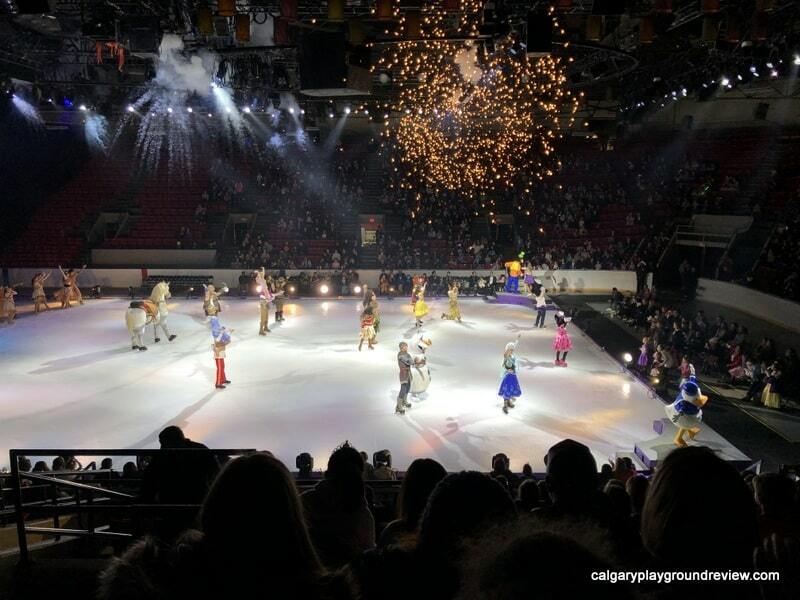 The production quality of Dare to Dream is very high – the performers are incredibly talented, set changes are seamless, costumes are picture-perfect, and there are some very cool special effects. 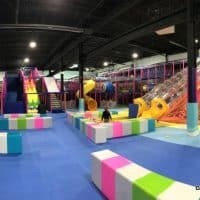 Both of my kids absolutely loved it, and so did my husband and I – we would definitely go again! We were provided with complimentary tickets to the show in exchange for an honest review. Love this! Makes me want to go next year!